If you are looking for services dealing with CNC lathe repairs then look no further because you have landed just the right place. We are a small company who have been providing electronic repair & design services in Winnipeg. Over the time, we have build a reputation for offering an efficient and reliable service in all aspects of CNC lathe machinery. For solutions tailored to meet your exact requirements, get in touch today. GC Custom Electronics proudly offers repair services for CNC lathes. The technicians under our roof are equipped with expertise in repairing CNC lathes. Our repair services are focused to meet the diverse needs of customers looking for efficiency in their lathe. Our technicians are up to the task in any situation to make repairs on-site, and as quickly as possible to minimize your downtime. Simply put, we are very familiar with these machines. Our technicians have dealt with lathes of all makes, ensuring a fast turnaround time and guaranteed satisfaction. Contact GC Custom Electronics today to know more about our CNC lathe repairs in Winnipeg. Clients who have converted to CNC controls have experienced significant increase in productivity, finish quality, and minimized changeover time. This type of equipment is most commonly used to machine railroad wheels and railroad axles. 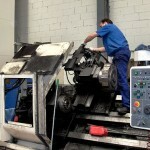 However, the magnitude of production runs of these highly complex machines will eventually require professional repair. Our services provide custom, heavy duty, large capacity lathe repair to clients in the component manufacturing industry and typically the railroad industry. Our unrivaled knowledge and expertise in the repair of some of the industry’s finest lathes makes us the number one choice for repairing lathes from all manufacturers. Each project is unique to us. We strive to repair your systems to bring them up to current machine tool standards. We address mechanical, hydraulic, electrical and lubrication systems. Our team is available for service calls when necessary, we are dedicated and committed to building long-term relationships with our clients and ensuring maximum satisfaction. To learn more about our repair services, please feel free to contact us for more information.